How you decide on your tradeshow staffing requirements depends on the type of shows and events you attend, the product or services you are promoting, and the estimated number of visitors – both prospects and current customers – expected to be in the exhibit hall at a given time. Whether you are attending regional, national or international shows, be sure to talk with your event sponsors and get detailed information on the forecasted number of registrants, job titles and companies represented, based on past conferences. Discuss any specifics of the show that make it unique, taking into account visitor expectations and cultural considerations. Also inquire about other exhibitors and the type of companies they represent. If your company has attended the show in the past, review files and notes to identify the number of leads and sales generated from show participation. In addition, to help determine tradeshow staffing, see if you can find out how many of your current customers will be attending the show. You will want to make sure you have sufficient staff and time to pay special attention to these individuals. For your staffing needs, consider what you are trying to accomplish with your exhibit and the type of hands-on requirements you will have. For example, will you need staff to help give product demonstrations to launch a new line of products? Will you need technical experts available to ensure computer systems run smoothly. Also consider any changes you are making compared to prior year shows to ensure you are always staffed to give individualized attention to booth visitors. Once you have an estimated number of registrants expected to attend the conference, you can use a staffing formula to determine how many members of your team to bring to the show. The following serves as a tradeshow staffing guideline, which can be adapted to your specific needs. Begin by multiplying the number of conference registrations by 16 to 20 percent, which is an industry standard for the percentage of people at a given event who will likely stop by a booth in the exhibit hall. Use the number of booth visitors you calculated from above and cut it in half (multiply by 50%). Take your revised number from above and divide it by the total hours your booth will be open during the conference. This will show you how many visitors you can expect to come to your exhibit each hour. Of course, there will be times when the exhibit hall is busier than others and you will need to adapt your schedule accordingly. Take the number of visitors per hour that you determined and think about how many staffers you will need in your booth to effectively meet and greet, demonstrate and sell your products in that time frame. From these calculations, you will arrive at a count of how many people you need to take to the show and schedule in your booth at any given time, recognizing there will be peak and low visitation periods during the exhibit schedule. 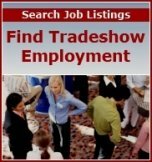 Assign Each Staff Member a "Trade Show Specialty"